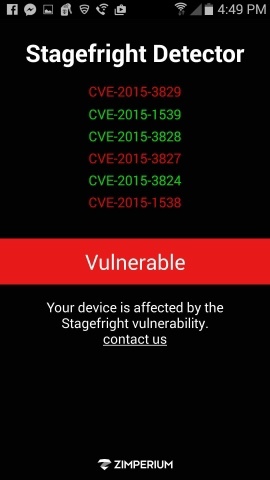 How safe is your Android device from the Stagefright bug? Android owners have been warned recently about the Stagefright vulnerability that can hack up to 95 percent of Android devices. A hacker can send a malicious MMS to your cell phone number and quietly infiltrate the device even without the knowledge of the user. After taking control of the Android device, it can be exploited using remote code execution bugs to collect private data and even perform functions on the device. 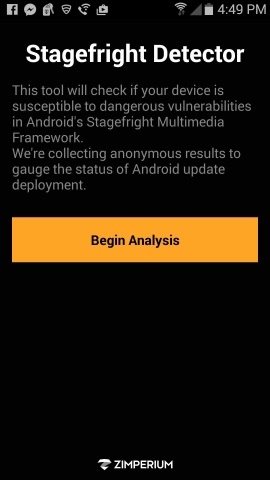 From the security research firm that discovered the Stagefright vulnerability, Zimperium has recently launched the Stagefright Detector App. This will help you find out if your device is vulnerable to the security bug, and if you need to update your mobile operating system. Nexus devices, a few Samsung models, and OnePlus One with a CyanogenMod nightly have already received patches that protect against the Stagefright vulnerability. But if you’re an HTC, LG, or Samsung owner, it is recommended that you download the free app. If the device is infected, the app will give you a warning and Zimperium will ask for your contact info and other details. According to an Engadget report, the Contact Me form allows Zimperium to “anonymously collect Common Vulnerabilities and Exposures (CVE) and fingerprint the device was vulnerable to.” The information will be shared with ZHA (Zimperium Handset Alliance) members to help to patch most of the Android OSs. And if you have a problem with your smartphone, the best place to get it fixed is visit iCare Repair website for repair quote. About the Author: Andrea B. is a mobile tech blogger for iCare Repair and is currently working on her Software Testing certification. You can find her online, at home, or at a sports bar cheering for her Michigan State Spartans.